Protagonize featured on CBC.ca/Arts today! 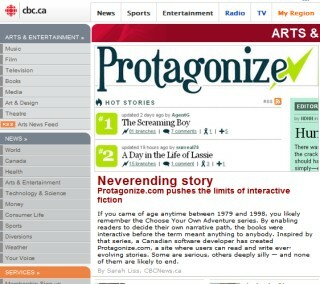 Protagonize is the featured story on CBC.ca/Arts today! Sarah Liss of CBCNews.ca interviewed me over the weekend and we discussed the site — from concept to launch — in some detail. I’m very pleased with the article and I hope it’ll be a boon to Protagonize’s growth. “”I don’t like a lot of the sites where they’ve created this false sense of community but they never ever interact,” he says. Bouton started strategizing the site to pass the time during his fiancée’s weeknight shifts at nursing school. Since he began sketching out the project in June 2007, it’s kept him busier than he ever expected. Over the last several weeks, he’s averaged four hours of sleep a night. Judging from his output, he’s up late cobbling together his own curious narratives. You can read the rest of the interview over at CBC.ca/Arts.